“Frankly, four years ago Desertec was all about bringing energy from North Africa. We abandoned that one-dimensional thinking. It’s now more about creating integrated markets in which renewable energy will bring its advantages … That’s the main objective,” he said. Critics of Desertec questioned the viability of a project to generate 100GW by 2050 at a cost of €400 billion, and doubts multiplied when founding shareholder Siemens pulled out of the venture in November last year. 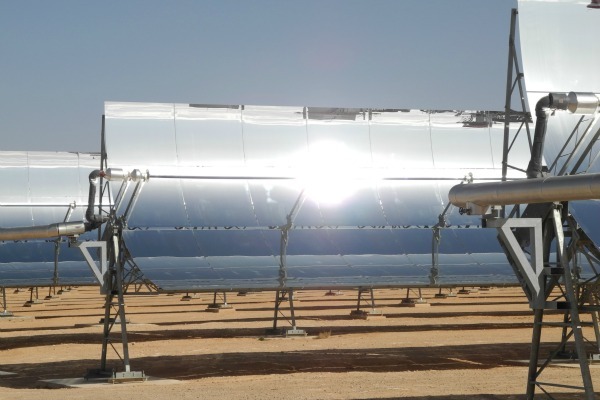 In the same month, Dii failed to get the support of the financially-strapped Spanish government for a 500MW CSP demonstration project in Ouarzazate, Morocco, though the project is still going ahead. “[Desertec] is not viable in its original form because it is too expensive and utopian. It attracted very little funding. It has essentially collapsed into more or less a bilateral deal,” argues Peter Droege, president of Eurosolar, an industry association. European electricity players question Dii’s initial business model, arguing that its export-focus was incompatible with current levels of grid interconnectivity between the Maghreb and Europe, and within Europe itself. They add that the market is already struggling to absorb additional renewable energy capacity. “At a very basic level, we are still missing lines and capacities for export,” according to Susanne Nies, head of Energy Policy and Generation at Eurelectric, the European electricity industry association. “Spain is already struggling with its own excess renewables production – additional imports from third countries would certainly compound the problem,” she added. “It is difficult to argue that the EU needs the additional RES capacity,” she said, noting that the technical, economic and regulatory framework of the electricity system needs adjusting in order to cope. Van Son, who wants Destertec to focus on market synergies, agrees that there is a long way to go before electricity market integration in Europe but argues that that there is a business case to be made. “If we see the tremendous synergies in terms of real money saving then politicians should not be allowed not to take advantage of these energy synergies. Harming the citizens of Europe and the Middle East is not what politicians should want to do,” he said. North African countries, the initial focal point of Dii’s activities, are concentrating on meeting their own domestic power demands, which are growing rapidly, and have anyway been hesitant to commit to what they see as unappealing European market conditions. “We don’t know if the prices of electricity on the European market are going to give us a return on investments,” said Mustapha Mekideche, the vice-president of Algeria’s state-owned Conseil National Economique et Social (CNES), speaking at an Algiers energy conference in November 2012. Algeria’s state utility group Sonelgaz signed a cooperation agreement with Dii in Brussels in December 2011, despite doubts from senior Algerian energy decision-makers over Dii’s future. “The countries of northern Europe need to show their willingness to buy electricity produced from renewable energy,” said Sonelgaz president-director-general Noureddine Bouterfa in an Algerian press interview prior to signing the deal. Despite Algeria’s ambitious target to produce 40% of its electricity from renewable energy sources by 2030 in a bid to free up more gas for export, progress in establishing projects on the ground has been slow, and a promised Dii-Algerian commitment on a CSP plant has not materialised. Dii still has its supporters, including German utility RWE, which is keen to expand into the renewable energy sector. In Morocco, the Maghrebi country that has been the most supportive of Desertec, RWE is currently in negotiations with partners to form a coalition, the first step in plans to construct 50MW PV and 50MW wind plants in the Kingdom. “We are convinced that the Desertec project is a very good opportunity to build up a renewable energy supply for North Africa. Although some people criticise the project, we believe that it will be successful in the long run,” said RWE spokesman Martin Pack. RWE confirmed that electricity produced from the Moroccan projects would be for the local market and not for export. “In terms of power consumption, the world is currently divided in two. On the one hand, emerging economies - Turkey, Brazil, China, India, etc. - are experiencing steep power consumption growth of impressive 8-10% a year. North Africa and Africa at large are indeed part of this trend. On the other hand, the OECD world, including the EU, are seeing negative power consumption trends till 2020. This is due to the continued recession, demographic changes, improved energy efficiency - and despite the fact that electrification is set to increase. Firstly, at a very basic level, we are still missing lines and capacities for export. Building these is technically difficult because of the deep waters in the Mediterranean. Moreover, it is not just the link between North Africa and Europe that is the problem. Rather, the question arises what happens with the extra capacity once it reaches the Iberian Peninsula. Spain is already struggling with its own excess renewables (RES) production - additional imports from third countries would certainly compound that problem. Spanish lines would need to be strengthened, with a view to moving excess electricity to France. But the interconnection at the Spanish-French border is also congested. Having said that, it is true that progress has been made in strengthening the Mediterranean ring of transmission lines, but this needs to be further pursued as a matter of urgency in the common interest of all countries concerned. Secondly, it is difficult to argue that the EU needs the additional RES capacity. Europe is currently witnessing a situation in which RES capacity is competing to replace existing conventional plants. This shift requires solving plenty of system issues, including the resynchronisation of the system consecutive to the development of RES, in particular variable wind and photovoltaic. Although variability is not a problem in itself, it obliges the system to change its way of functioning, which also means giving time to the technical, economic, and regulatory framework to adjust. Adding even more RES from Desertec in the meantime would probably not support this move. The EU is hoping to reach its long-term goal of de-carbonising its economy by topping up domestic renewable energy production with solar electricity imports from North Africa. One of the flagship projects in this regard is the Desertec Industrial Initiative, which was launched in July 2009 by 12 companies who agreed to establish financing plans to develop solar projects in the Sahara Desert. The €400-billion Desertec project aims to eventually provide 15% of Europe's electricity needs with solar power imported via a high-voltage cable. But this strategy was put into question in November last year when two major investors, Siemens and Bosch, pulled out of the project. True is that RES are just “presented” in Spain as responsible for both power generation surplus and an “electrical deficit” in campaigns driven by the incumbent utilities to protect themselves from the mistake of building 27000 MW of subsidized CHP in the last years. RES should be kept out of the market especially via short-sighted retrospective measures on supporting schemes. Talking about the “very expensive” CSP is another unserious statement since all reported costs related to CSP vary widely across projects recently completed or under construction worldwide. The generating costs of CSP plants depend besides the effects of still-needed innovative support schemes on the direct normal irradiation (DNI) at the specific project location, the size of plant, the optimization of the plant design, the technology costs, the cost reductions achieved through technology improvements, the increased competition in the supply chain and the learning curve effects. …the chickens are coming home to roost – or rather, the birds have flown never to come back. This should be a salutory lesson for all the subsidy junkies involved in solar. Not one of these installations, domestic or commercial, would be viable without the huge subsidy forcibly extracted from end users by government dictat. If solar is not viable in this region then it’s not viable anywhere. I don’t suppose that will stop the green jihadists from pushing it though, despite the fue poverty it’s causing, mostly to the low income and elderly. Yes, John B, quite right too, let’s continue to invest heavily in infrastructure for the use of fuels which will eventually run out and cause much pollution and damage to people’s living environments in the meantime. Even if one was to accept(and personally I would dispute this in terms of a genuinely long-term CBA which took ALL relevant factors into account) renewables are not as economic as they could be, that is down to most European countries, not least the UK, continuing to bury their heads in the sand about the realities of securing long-term energy supply. The only jihadists here are those who for idealogical reasons and/or short term economic gain are spreading myth and misinformation on renewables. Europe, like many other parts of the world, finds itself under pressure to address major challenges including climate change, a growing dependence on energy imports, increasing strain on energy resources and the need to ensure access for all consumers to affordable and secure energy. To achieve these goals, the EU is putting in place a wide-ranging energy policy, covering the full array of energy sources from fossil fuels (oil, gas and coal) to nuclear energy and renewables (solar, wind, biomass, geothermal, hydro-electric and tidal). The bloc’s aim is to put in place a low-carbon economy, whilst making energy resources more sustainable and more secure, and ensuring low prices for consumers. Well, they ran out of other people’s money and suddenly reality appeared before them. ‘Green’ is without doubt the new ‘Stupid’, only often the stupidity is to be found mostly in those who decide to subsidise blatant foolishness. The so-called ‘renewables’ are blatant foolishness. We have better and cheaper ways to generate the large volumes of energy we need. Sam F: what isn’t renewable about sun, wave, and tidal energy?